The 2018 Kindle Fire HD 10 is Amazon’s largest member of the Kindle Fire Family and their answer to Apple’s iPad and is 10.3″ x 6.3″ x 0.4″, with a 10.1″ HD screen with lovely colors. The screen is just slightly smaller than a comics floppy. It is a solid-feeling and durable tablet that lacks the somewhat flimsy feel that some older kindle fires and newer netbooks have. For comics reading, it was quite comparable to reading an actual book. The pages were close enough in size to the actual floppies that there was no resizing distortion. Everything was readable as-is and showed a delightful amount of detail in black-and-white and color issues. Viewing angles are excellent as well. Page turns were quick and not distracting. Downloads came fairly fast, comparable to other new gear with multiple Wi-Fi band reception. Reading PDFs was also very comfortable, again with quick load times and the screen size working well to make things read very nicely. It felt very similar to reading from a smaller graphic novel collection in size and heft. The device fits well in the hand and doesn’t get the severe hot spots that a similar-sized windows tablet would have, even after several hours of hard use; though the top-back did get warmer to the touch. On Kindle, or ComiXology, Amazon has a guided view for reading comics and graphic novels that shows you a comic one frame at a time. While not the same as traditional reading and not showing you the full page, it can lend itself to easier parsing of the narrative for those unused to reading comics or with poorer vision. It’s more useful for reading comics on smaller screens, where the full image when presented is too tiny to read. For more traditional books, it presents the usual Kindle viewing options with reliable and consistent readability. It also has text-to-speech, and while it’s better than earlier versions, it still suffers from robotic speak-and-spell voice syndrome. There is a larger variety of voices to choose from, however. Audible narration would be my choice for those who are vision impaired, or those who simply prefer spoken word to text. The sound is decent considering the size of the device, and it doesn’t have that tinny, feeble tone that some tablets have. If you’re low on space and wish to travel with your favorite comics and graphic novels without weighing yourself down, I would totally recommend the Kindle Fire HD 10 for keeping as close to the original reading experience possible. It’s lightweight, sturdy, and very reasonably priced, with good integration and crossover if you have a book collection that spans both Amazon and ComiXology ecosystems (although you have to download the Comixology app separately). The post 2018 Kindle Fire HD 10 Review: Durable and Reasonably Priced appeared first on Bleeding Cool News And Rumors. 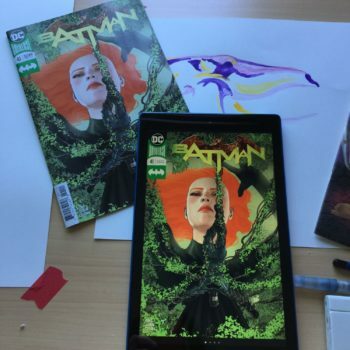 Vía https://www.bleedingcool.com/2018/04/12/2018-kindle-fire-hd-10-review/ ʕ ᴖᴥᴖʔ Subscribe to me here on Youtube!